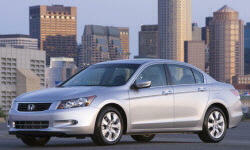 Honda Accord Driving Position & Visibility Pros and Cons | Page 1 of 2 | Why Not This Car? What drives people to buy (or not buy) a certain car? TrueDelta's members share Honda Accord pros and cons based on their real-world driving experiences. Nothing distinguishes the new Honda Accord and Toyota Camry more from one another than their driving positions. Back in the 1980s Honda was known for ultra-low instrument panels and huge windows. That Honda is long gone and apparently isn't coming back. The front and rear pillars are thin, and the windows are large, providing excellent visibility. You sit well above the Honda Accord's instrument panel, and all of its windows are unfashionably large and set at a form-follows-function angle. In these respects, the car's driving position is excellent. Visibility is absolutely atrocious in the coupe with horrible blind spots. However this is expected in a coupe. For a coupe with such a fastback profile, the visibility is excellent. The driving position is near perfect with a commanding view of what is ahead. No feeling of a blind spot, I can reliably see all around without turning my head too much. I was able to easily find a relaxed, comfortable driving position, critical for long distance driving. Excellent range of adjustments between seat and steering wheel, which has both tilt and telescope. No apparent blind spots. Always have a sense of awareness of everyone around - a relaxed driving position is easy to obtain. Can cruise all day without getting tired in the shoulders and arms. Comfort of seats with good visibility and sensible controls. Overall, very good ergonomics. The new design made the back pilars too large , very hard to shoulder check and created blind spots.